When it comes to choosing the right speakers, there are many things to consider. People have written countless articles and books about this topic, but we’ll attempt to break it down right here and give you the basics. 1. Understand how you’ll be using your speakers. Will your speakers be projecting speaking voices, singing voices, orchestras, a combination? The most critical deciding factor on which speakers you’ll need is volume. This is so critical because of the obvious: speakers are made for sound and have been designed to perform optimally up to a certain sound pressure level in the room. High Impedance. 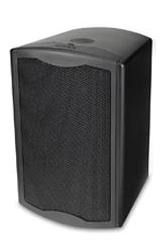 Places that are planning on using speakers for only PA systems and other lower-volume functions, such as corporate offices, warehouses, schools, and grocery stores, should look into high impedance speakers. Also known as a distributed system, they tend to be low profile and low sound pressure. Low Impedance. If you’re looking for speakers that will be used for louder volumes and any audio other than the spoken word, your best bet would be to look at low impedance speakers. These do require much greater amplification, so there will be more equipment needed than with high impedance speakers. But the low impedance will give you the needed dynamic range and clearer sound. 3. Think about speaker placement. This is when aesthetics and sound distribution work together. Placement is very important for sound quality. Sometimes speakers may need to be in visible spots. Other times, you may want the speakers to “blend in” as much as possible. It’s always best to consult with an audio professional to determine what’s best for your situation. 4. Select the right speakers. Now that you’ve determined function, location, and placement, it’s time to select the right speakers. Many brands and styles exist, but when it comes right down to it, you’ll probably be deciding between different versions of the two main styles: ceiling speakers and wall-mounted speakers. Here are the pros and cons of each. Pro: Ceiling speakers are concealed, and they provide an overall great sound coverage at low sound pressure levels. Con: Professionals should always be the ones to install ceiling speakers, and it’s always best when this installation happens during construction or renovations. Pro: Wall-mounted speakers are easier to install, and they can be installed as an afterthought (i.e. they don’t need to be installed during construction). Con: Obviously, they’re more noticeable than ceiling speakers, yet they can reproduce at greater sound pressure levels. For more information on choosing speakers, give us a call at 800-786-1556. Or email us today. One of our professionals will be happy to work with you. What Sounds Works for You?